Oh the crazy web we weave when surfing the interwebs. This weekend I stumbled upon the new Goody site, which is pretty spectacular and makes me more than a little sad that it appears their coolest line, Retro Deluxe, may only be available at Target in the states. If you haven’t taken a trek down the hair accessories aisle at your local Shopper’s, Wal Mart, or other big box store, do yourself a favour and do so – you’ll probably be pleasantly surprised at the fashion-forward, affordably priced goodies that await you. 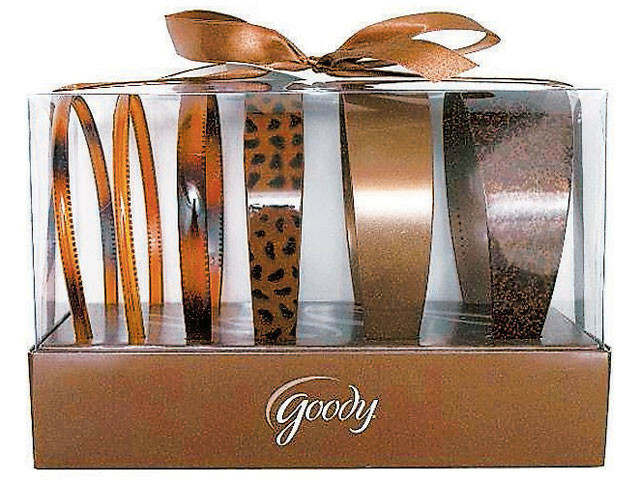 The exciting news is, this year Goody has put together some pretty nifty gift boxes that are perfect for last-minute gifts for your girlfriends, siblings, nieces, and daughters. 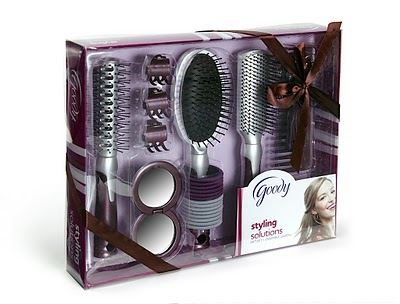 At less than $10 CDN each, these are ideal finishers that you can easily pick up, wrap, and gift, and the variety of sets available is suitable for any age, hair type, and needs. If you’re stuffing stockings for the little ones, consider the Elastic Explosion set, or the super cute girl’s purse. For the girl that’s always accessorizing, seek out one of three Fashion Now headband collections in colour coded looks to go with any wardrobe. And never underestimate the value of a new brush – hair is a fickle friend, often getting bored of the same ol’ products and tools in a hurry – with the Styling Solutions kit. The thing I like about these hair accessory sets – aside from the major cute factor + insane price – is hair accessories are kind of overlooked in the gift-giving department. Aside from the other showstopping headband picked up at the likes of Aldo Accessories, it’s rare to get those uber basics – clips, brushes, and elastics – and it’s always nice to save a few drug store dollars. Beyond that, the Goody sets I’ve spied have lots of fun, sparkly, festive touches to them, to the point where they look a lot pricier than they actually are. Cheap chic = a total holiday winner. Where can I find the headband set you have pictured. I want the cooper headband. Hey Terri! Unfortunately where this post is nearly three years old, I can’t really tell you whether these sets are still available anywhere. If anything, I’d recommend a visit to Shoppers Drug Mart, London Drugs, or Wal-Mart for a similar product. Good luck!